On 31 March, Laura Massaro from Lancashire won her first KL Open title after a superb display to beat England compatriot Alison Waters in the final at the Berjaya Times Square, Kuala Lumpur. In a repeat of the British National Championship Final last month, Massaro who lost to Waters in Manchester, exacted her revenge by winning 11-9, 11-7, 11-6 in the first World Series Final to hold two English finalists since the 2010 Australian Open. 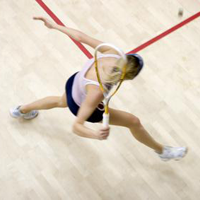 It was Massaro’s 11th Women’s Squash Association (WSA) title and her second WSA World Series title, following her US Open triumph back in 2011. “I’m really happy to have won because I have never done well in Malaysia in the past. I’ve only had one prior semi-final appearance here (in 2009) and I was initially just looking to get past the quarter-finals,” said Massaro. The final was held in front of crowds of shoppers at the Berjaya Times shopping Square and whilst suffering a reversal in this match, Waters will be delighted to have reached another World Series Final having endured twelve months out of the game with an Achilles injury in 2011. The English pair will now focus on the next World Series event on the WSA calendar, the Allam British Open at the KC football Stadium in May, the first squash event to be held in a football stadium.